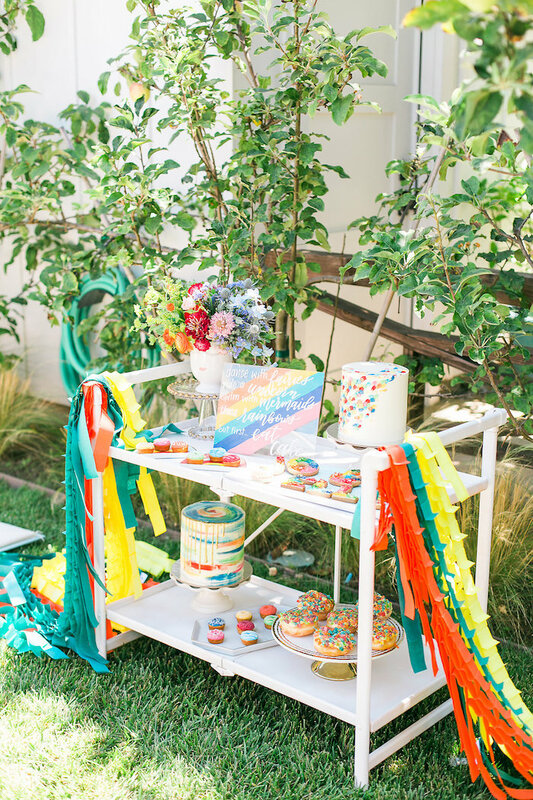 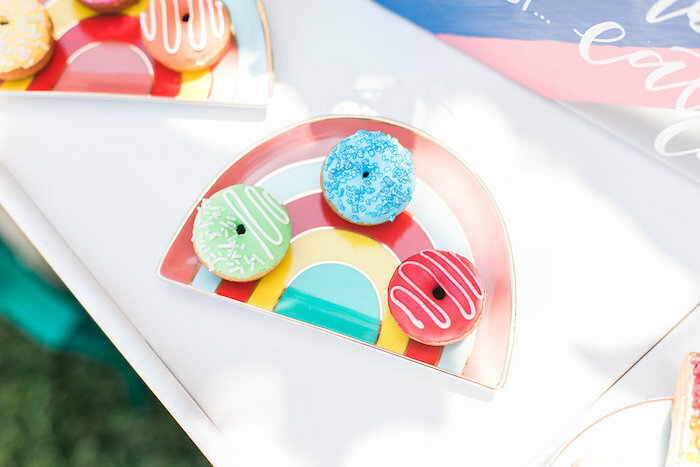 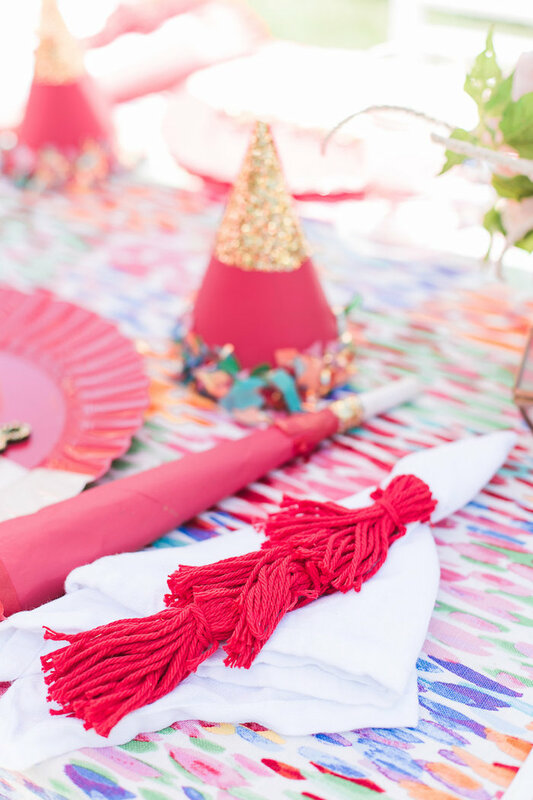 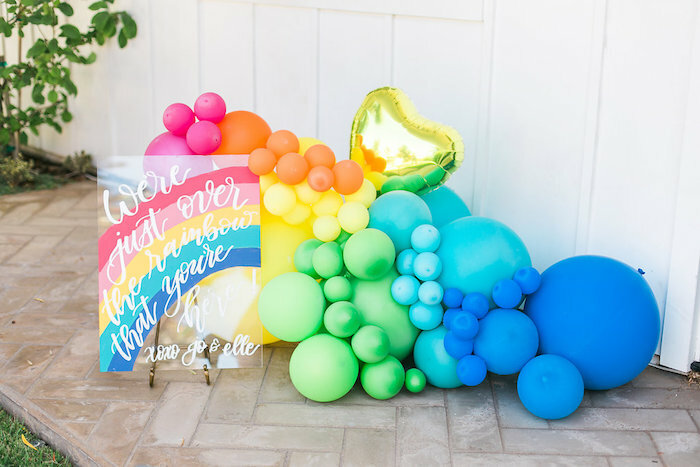 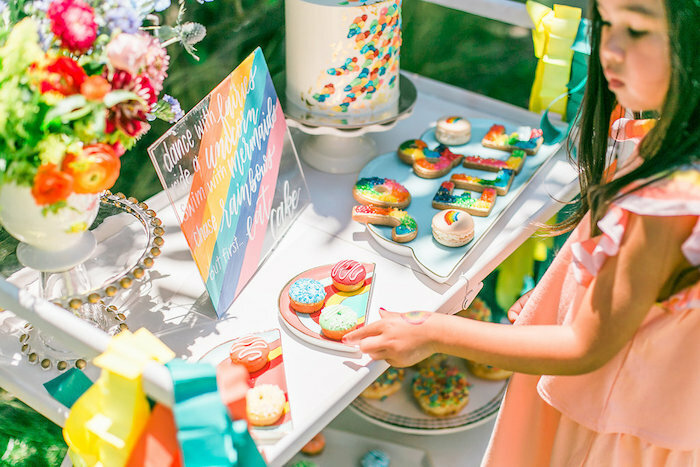 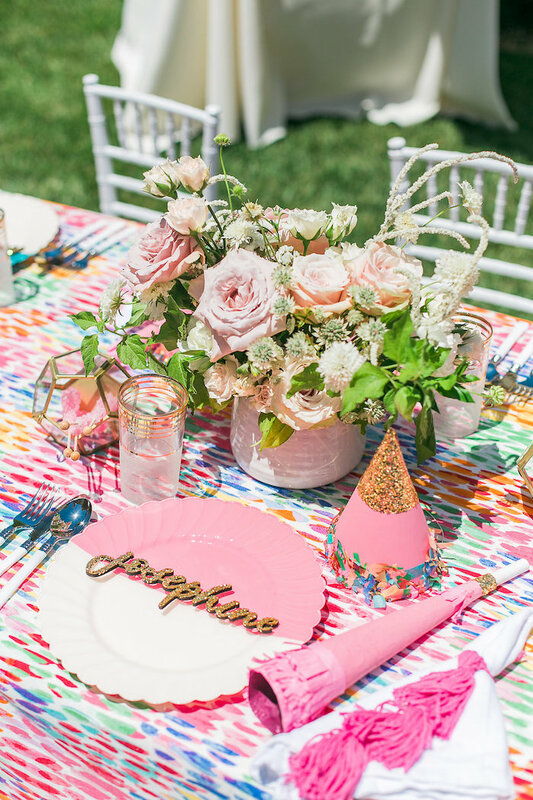 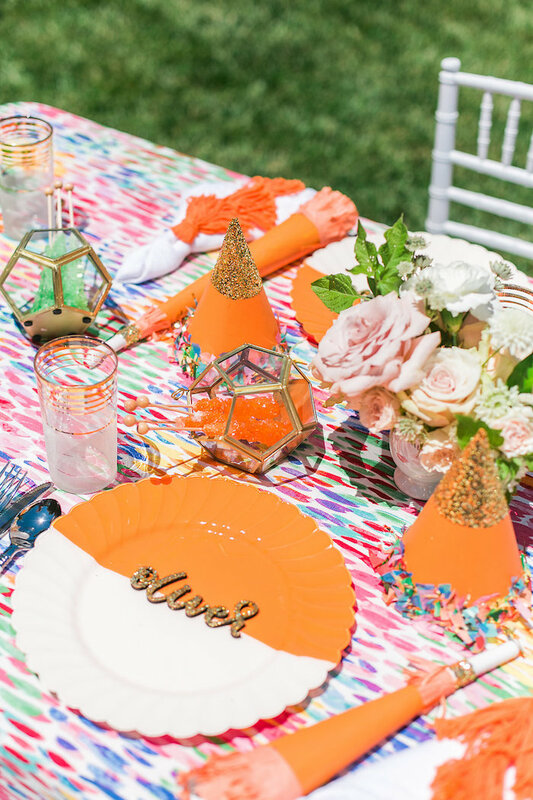 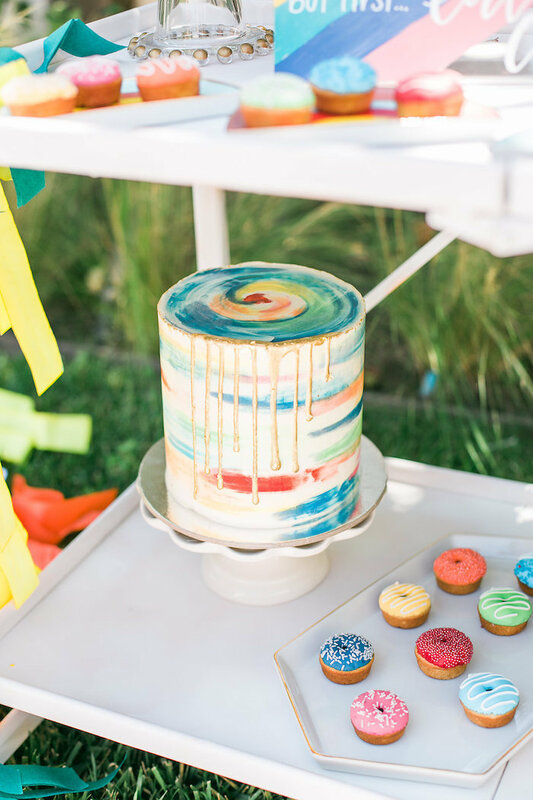 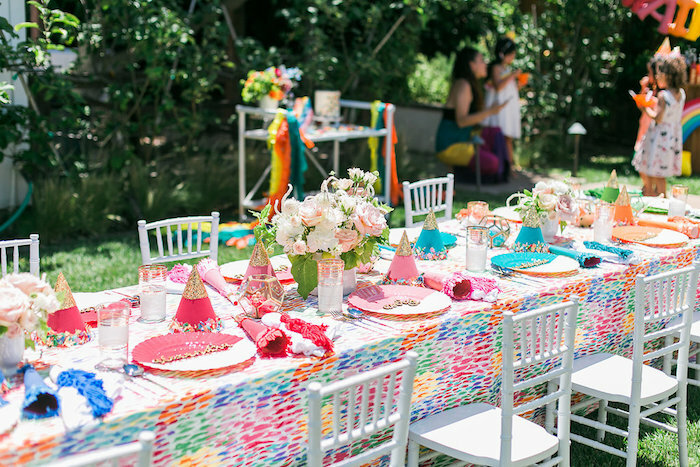 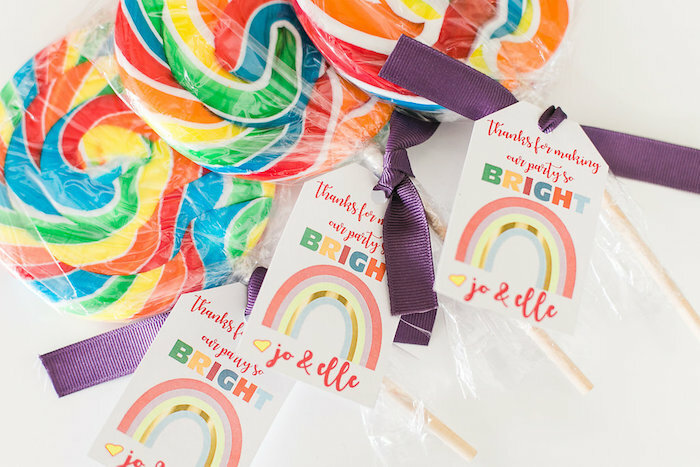 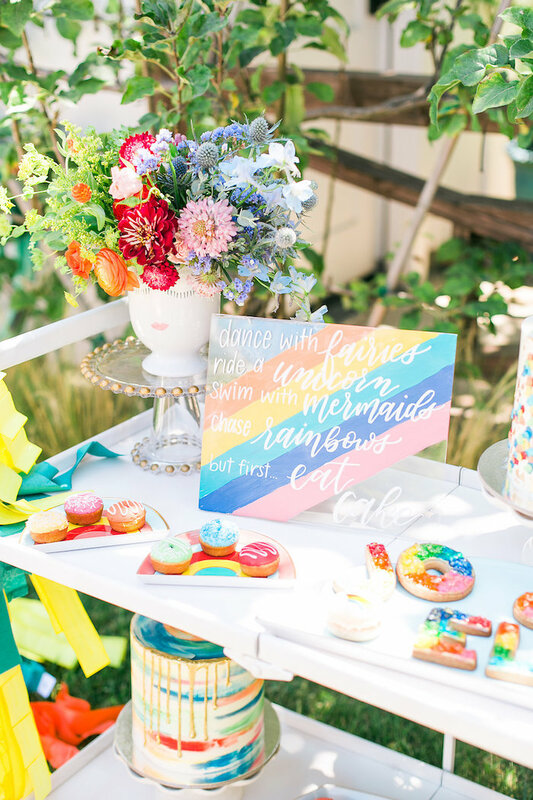 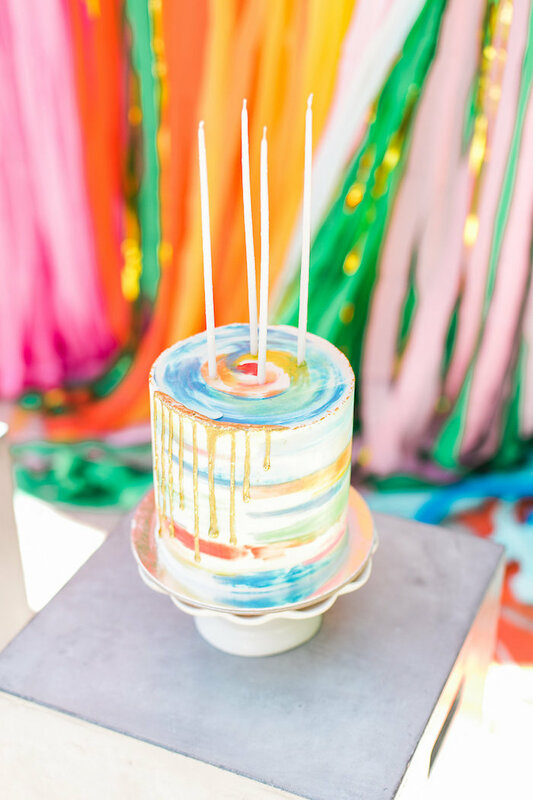 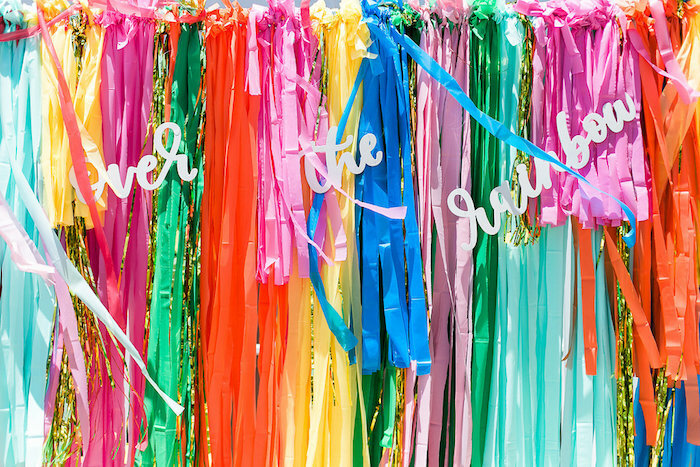 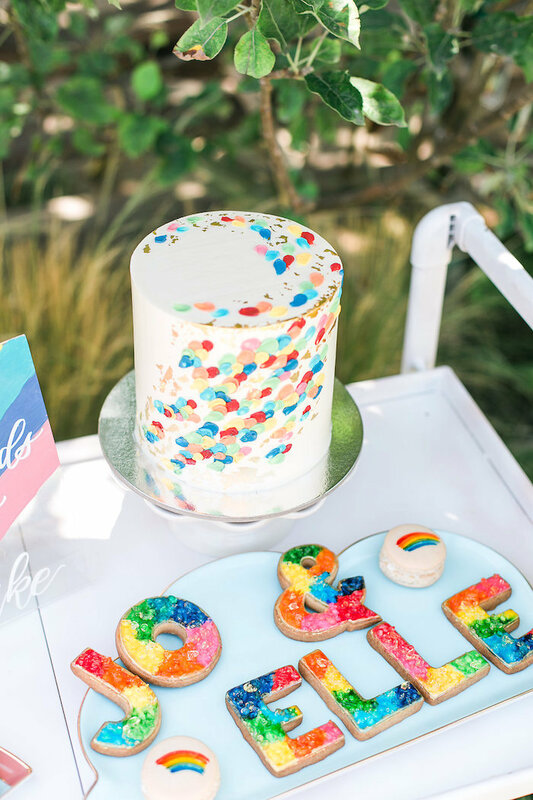 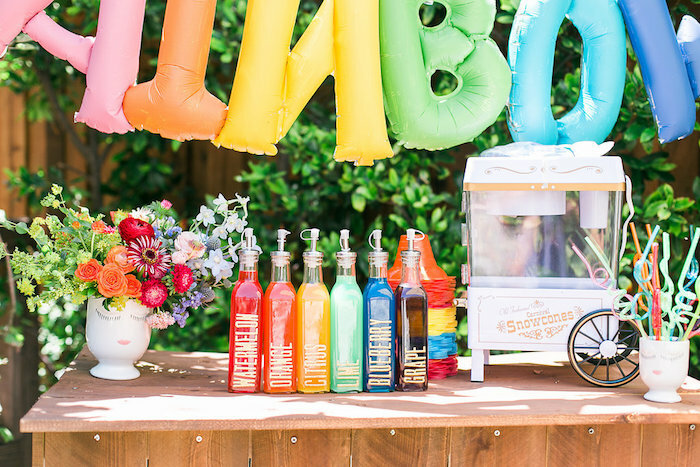 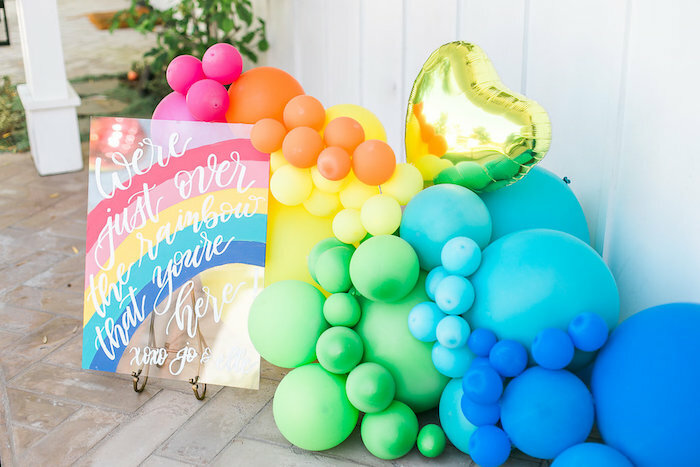 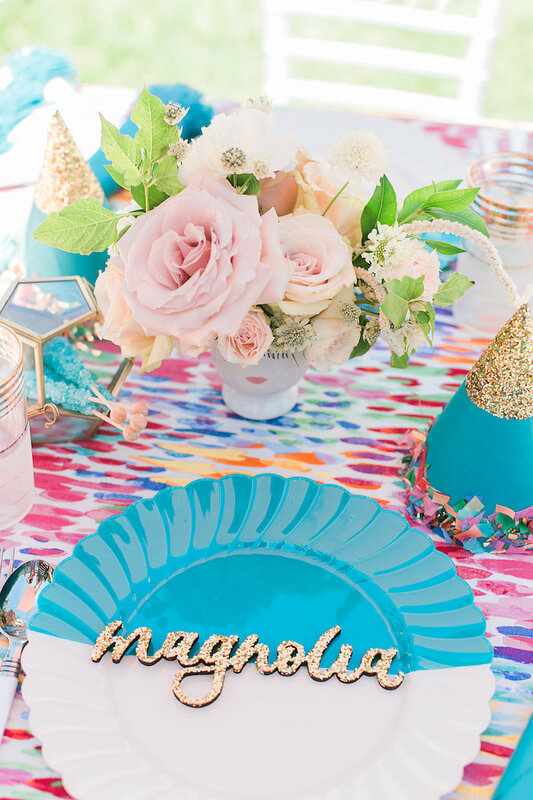 Bright decor and a little bit of glam, this Over the Rainbow Birthday Party by Jacqueline Marino of Deets & Things, is a colorful slam! 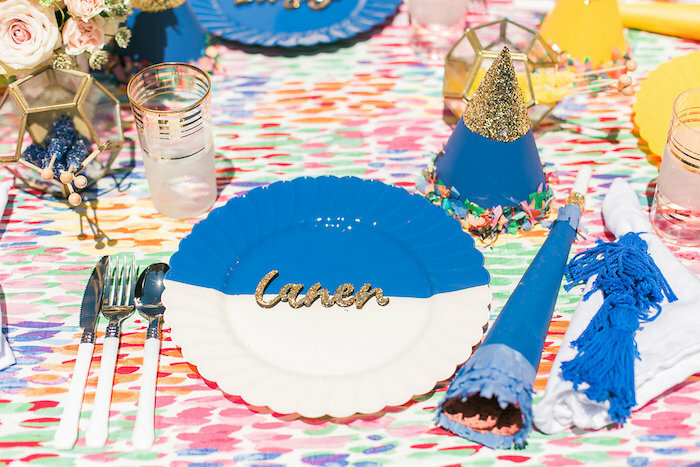 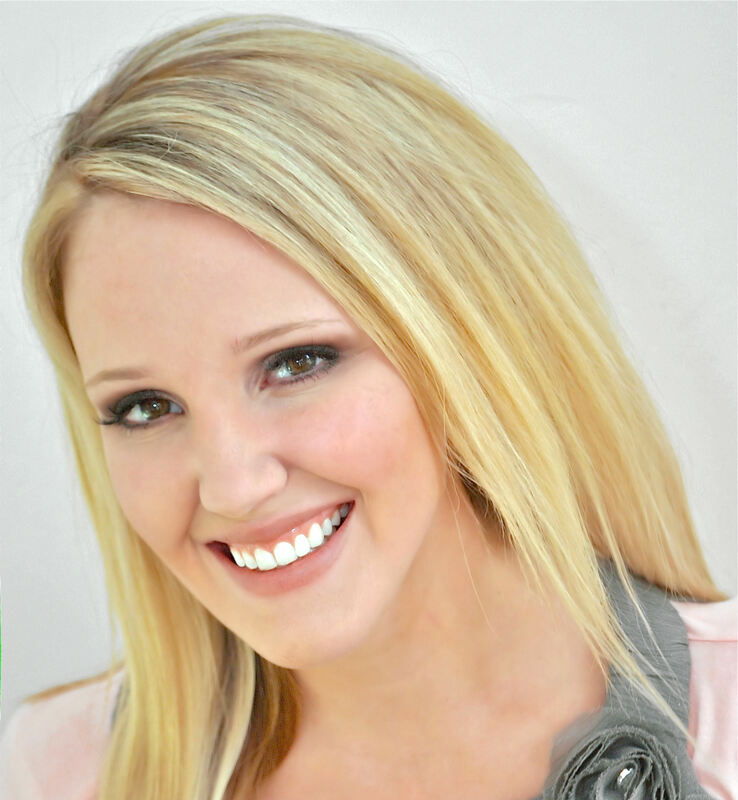 Filled with details so lively and fun, this birthday party is to be had by everyone! 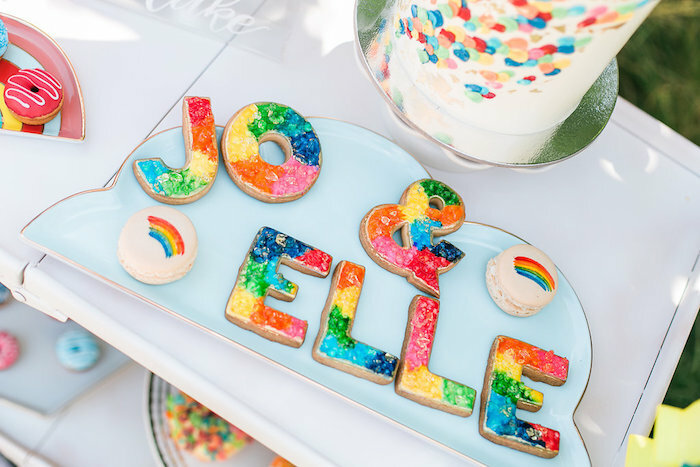 And custom rainbow sweets/cakes arranged on rainbow plates! 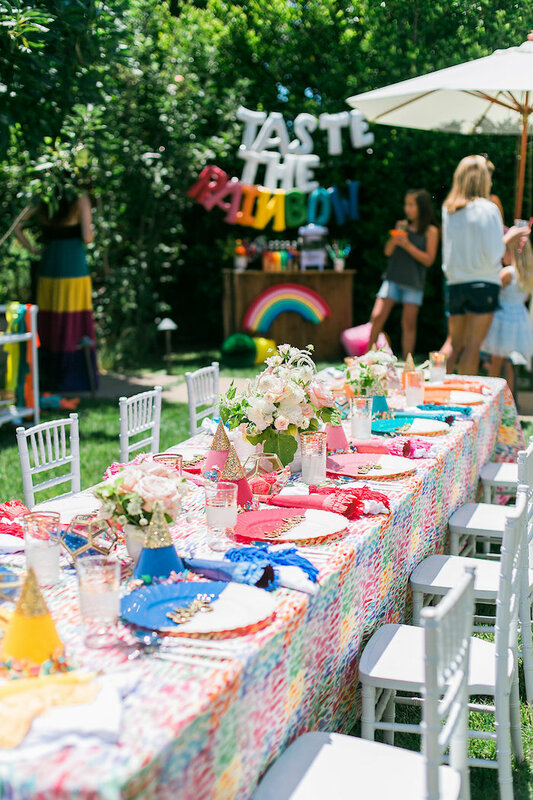 Jacqueline’s party snippet“Inspired by the Chloé rainbow dresses she recently bought her daughters–Josephine and Eleanor, Liz asked me to design a colorful rainbow themed party for their joint 4th and 5th birthdays. 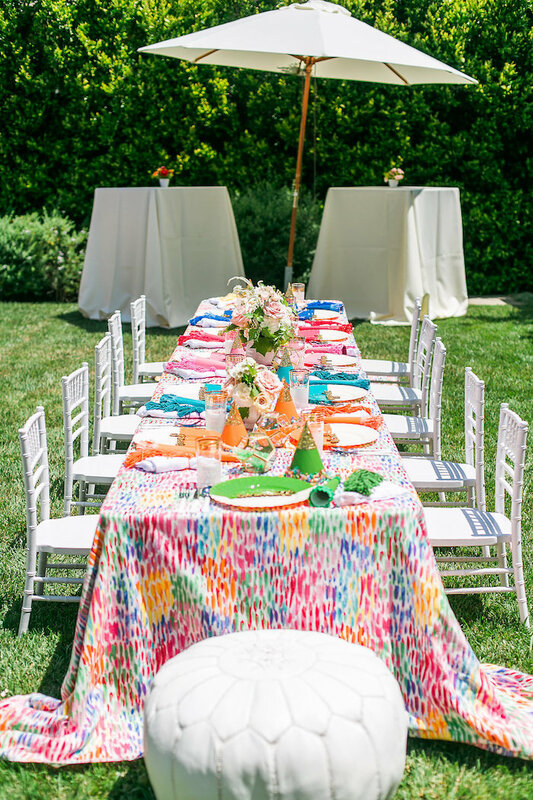 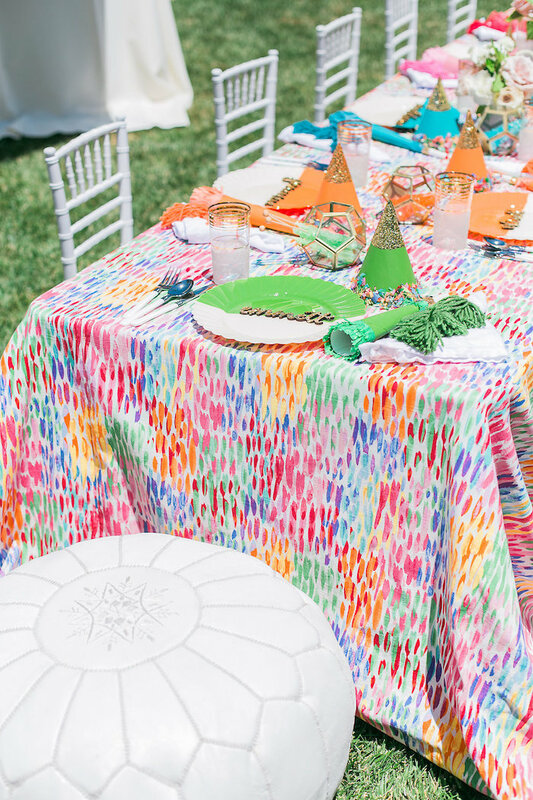 Set in her Newport Beach backyard, I used La Tavolas vibrant Fiesta Rain linen as the basis for the color scheme of this lively bash. 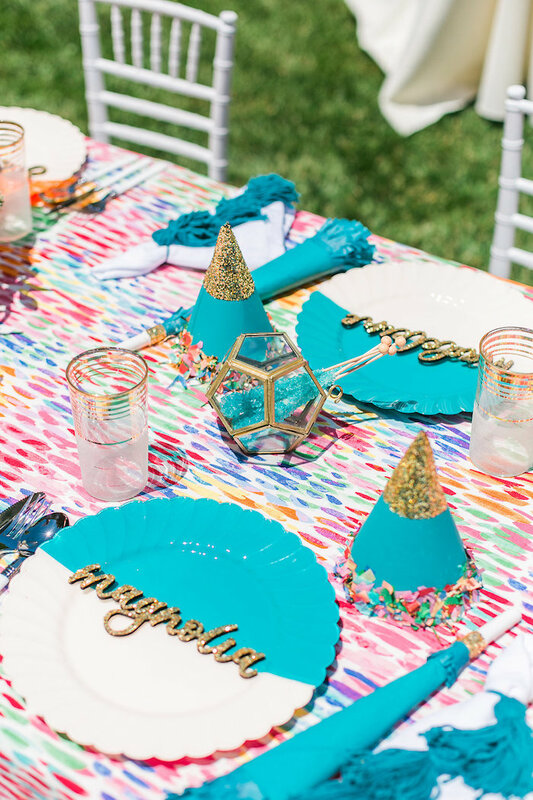 I paint dipped plates with food safe paint, made napkin tassels, party hats and party horns to coordinate with the colors of the linen. 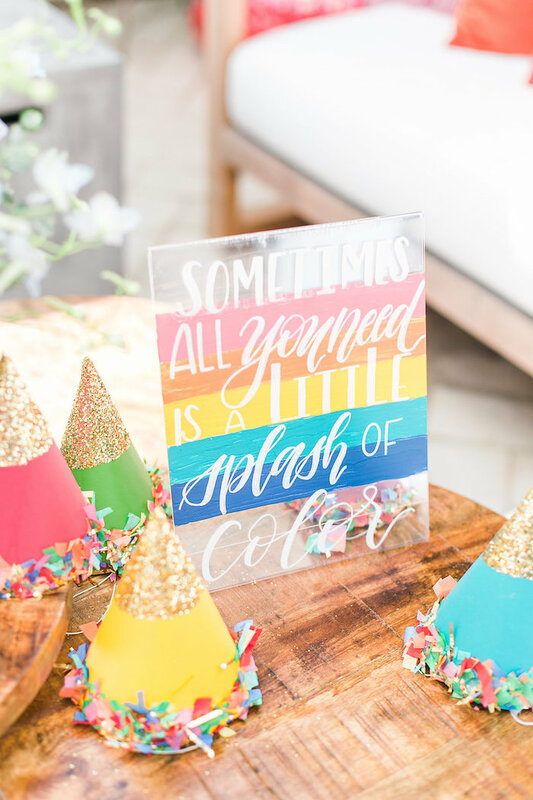 Each setting for their tiny guests was then finished with glittered laser cut placecards by POPPYjack Shop and rock candy in the perfect hues. 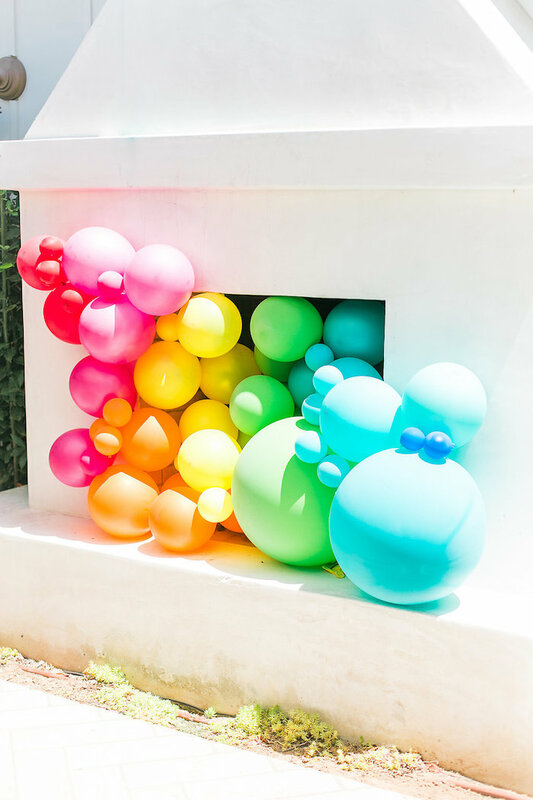 Bright pillows, and cascading balloons in the outdoor fireplace dressed the backyard lounge. 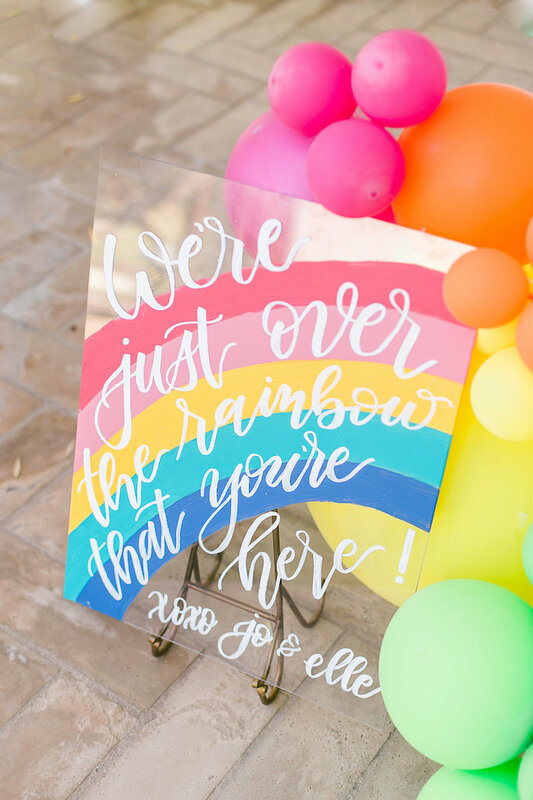 With Love Calligraphys fun script popped against the acrylic signs I painted and Not Just in Novels gorgeous rainbow blooms in Celfie vases, gave the party space a fun and funky vibe. 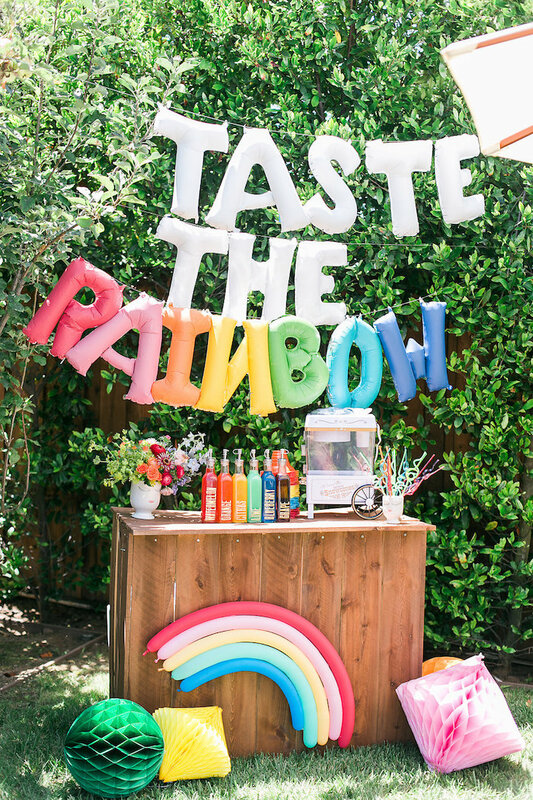 It was scorching summer day so the snow cone booth with its Krazy straws and array of rainbow flavors was a huge hit with guests of all ages. 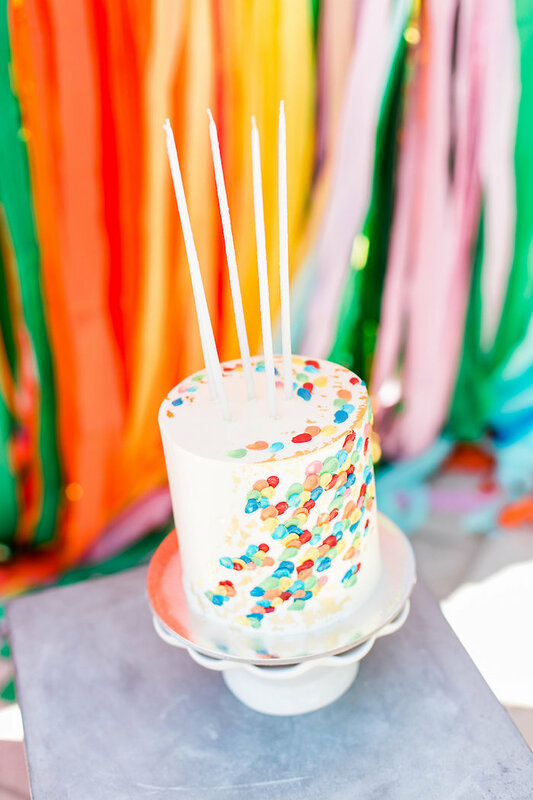 Thankfully, there was light sea breeze and when it blew though the layered backdrop I made with help of Poppyjack Shops woodwork, it set the ideal scene for photo booth and candle blowing fun! 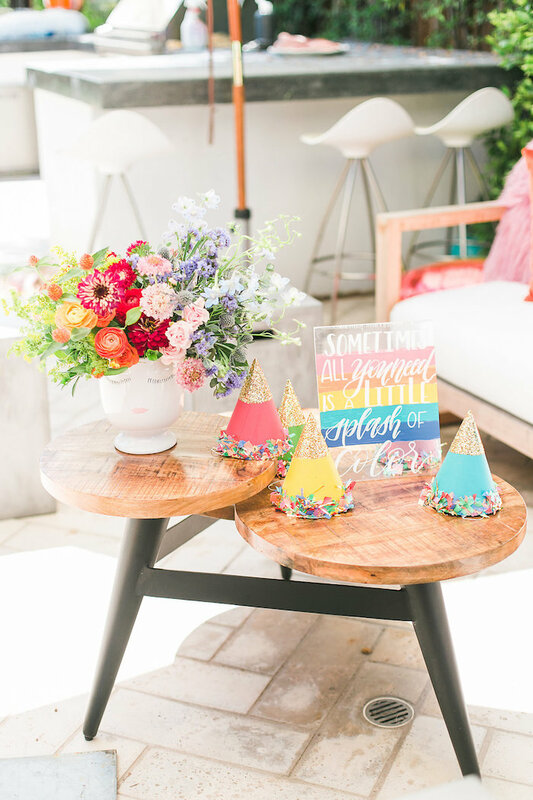 This bright and vibrant party was the perfect splash of color, these birthday gals needed to bid goodbye to summer”! 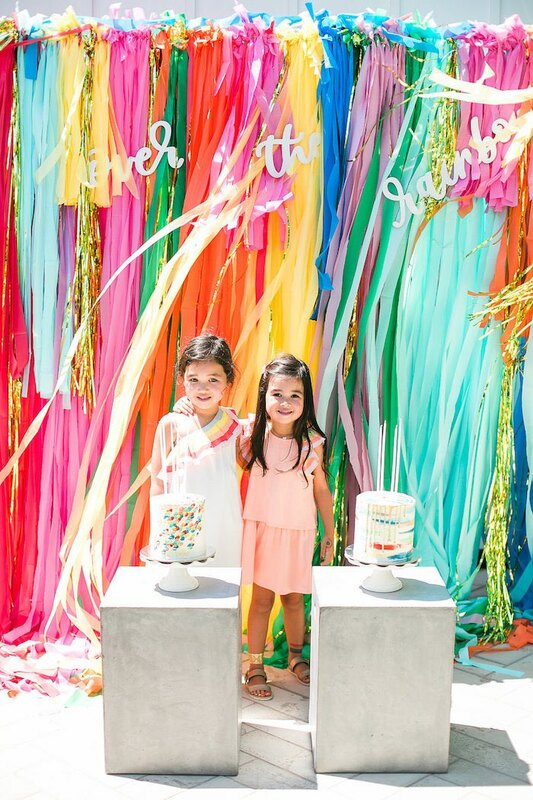 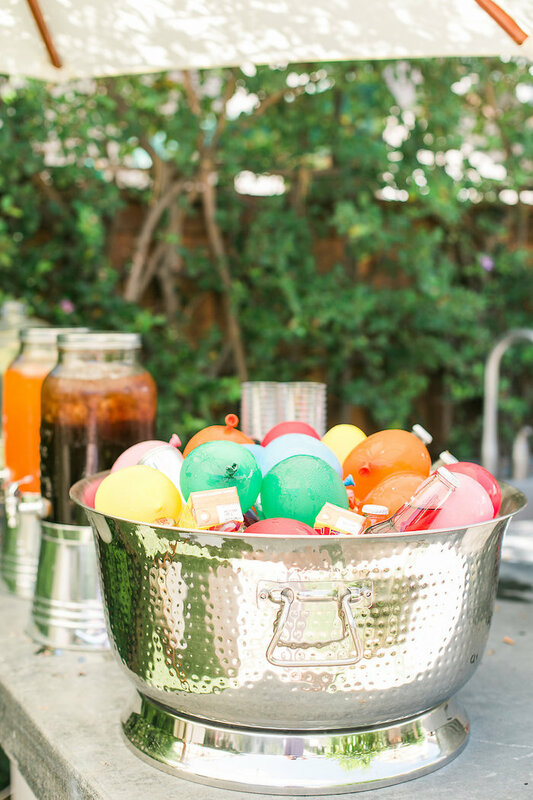 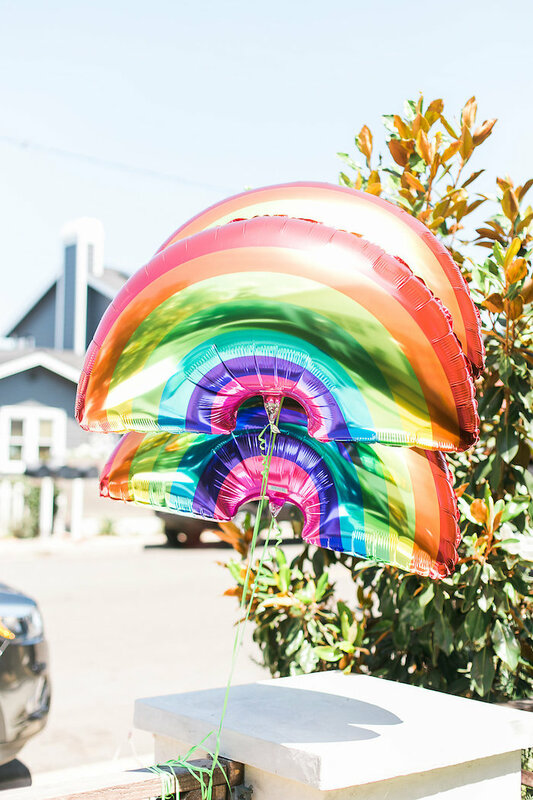 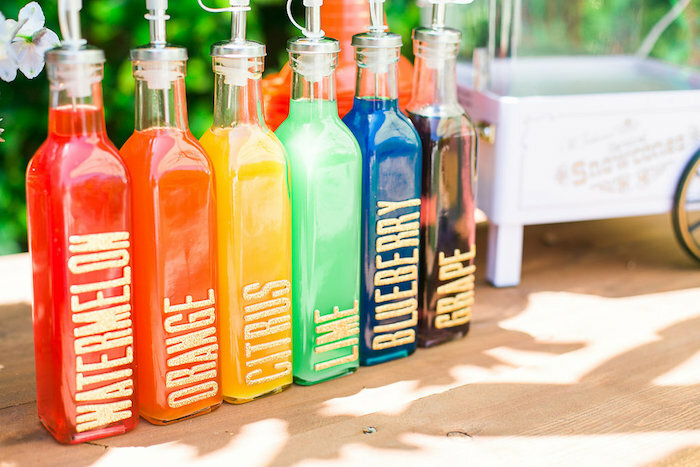 See all of our rainbow birthday party ideas here!